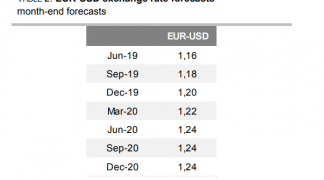 The Euro is set to outperform the British Pound and other major currencies according to the latest update to the foreign exchange forecasts held by Goldman Sachs. 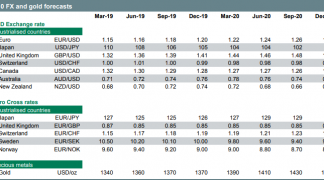 The Euro remains one of the outperformers in global FX with the second half of January being characterised by further Dollar weakness, in line with longer-term trends, that saw the Euro-Dollar rate hit a high of 1.2537. However, against Sterling the Euro fell, with the Pound-to-Euro exchange rate rising from 1.12 to a high at 1.15 as the Pound proved to be the best-performing major currency in January. Despite the single-currency's decline against Sterling at the start of 2018, global investment banking giant Goldman Sachs expect the Euro to rise against the rest of its G4 peers in coming months, Sterling included. "Activity in the Euro area remains very healthy (running at about 3.5% in recent months on our Current Activity Indicator), the ECB has turned its attention away from easing and toward the fine-tuning of its exit strategy, and FX reserve managers have plenty of scope to add EUR assets," say Goldman Sachs FX Analysts Zach Pandl and Kamakshya Trivedi. By contrast, they are not as optimistic about the prospects for Sterling which they see losing ground against the single currency due, mainly to the weight of Brexit risk. "As news over the past week has demonstrated, investors should expect a bumpy path toward an eventual Brexit transition deal between the UK and its EU partners," say the authors. The Pound suddenly lost ground at the start of February after it was revealed that the EU Commission had rejected a proposal from the City of London to agree a bespoke financial services deal between Britain and the EU after Brexit. The city's financial services industry is a major breadwinner for the UK economy and if it loses its free trade rights with the EU it will be a major blow to London's standing as the financial capital of the world, and hit the UK economy. While the details might not have been the cause, the moves serve as a reminder that Brexit angst is still with Sterling and will be a feature to watch over coming months. 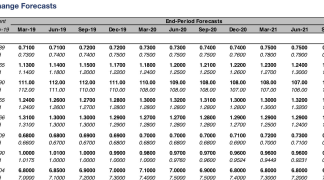 As such, Goldman forecast "that EUR/GBP will head back above 0.90 this year, on a combination of messy politics and an underperforming economy." This translates to a fall to 1.1125 for the Pound-to-Euro exchange rate. 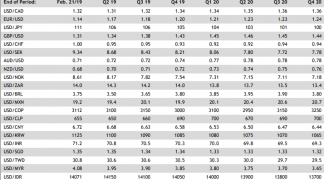 The Goldman Sachs analysts do not mention the possibility that the Euro is considered by some as 'overly strong' and that it could weigh on inflation by making imports cheaper and therefore be counter-productive to the efforts of the European Central Bank (ECB) to lift inflation to its just-below 2.0% target. This has been put forward as a counter-argument by some analysts against the single-currency strengthening further. An overly strong Euro could halt the European Central Bank (ECB) in its drive to end QE and raise interest rates a process known as 'tightening' which is normally positive for a currency, as higher interest rates attract increased inflows of foreign capital seeking higher returns. It has been hazarded by analysts at BNY Mellon and Nordea Bank for example, that the ECB may put the breaks on monetary policy in order to curtail Euro strength. Yet even those who see the risk of an ECB reaction to the Euro generally agree that at best the central bank will only manage to slow the rise and will be unable to halt it altogether.